Chickens were my Gateway Farm Animal. It started innocently enough about fifteen years ago --- I envisioned bucolic yard ornaments that clucked, with breakfast fringe benefits. I bought a starter coop and six chicks from my local feed store, put the coop together where I could see it from my suburban kitchen window and waited impatiently for eggs. Unfortunately, the entire first batch was killed within weeks and I learned My First Important Farm Lesson.....Animals count on their Farmer for Competent Stewardship. The starter coop was clearly inadequate on many levels but I did not know enough to know what I didn't know. It is no fun to discover tiny dismembered chicken bodies inside a small faux coop and it was a lesson that stayed with me to this day. I immediately set upon building a chicken fortress...my oldest son dubbed it Cluckingham Palace and it was, indeed, over the top. Regardless, my new chickens were safe and I was happy, even if the eggs averaged out at about $150 a dozen. It wasn't long before Chickens were not enough...I needed more. I soon had five goats frolicking in the back yard. My home was on a small lake and boaters would point and laugh, not sure that they were actually seeing what they thought they were seeing....young Nubian Goats munching happily on mango trees. My beautiful tropical yard quickly turned into a sandy, desiccated wasteland, but I learned to milk and I made goat cheese. This farming thing was a blast! Ruby pranced in the front of a tropical Trumpet Tree while chickens foraged in the backyard. Years have passed and I have morphed from Suburban Hobby Farmer to full on Homesteader. The Farmer and I work the land using minimal outside inputs....the farm provides much of what we feed our animals, we use no chemicals or herbicides and we employ limited fossil fuels, preferring to farm the old fashioned way. We heat with a wood stove and muddle through hot summers without air conditioning. We don't have a television but we do have internet. In many ways it feels as though I have stepped back in time! 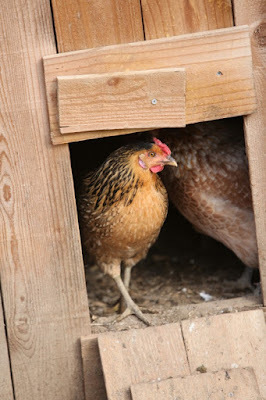 This year we raised Meat Hens--a first for us--- and it was a real learning process. Our Laying Hens free range...they sleep in a coop at night but are free to roam about the pastures throughout the day. The Meat Hens were a different story. Our first batch lived out their entire 8 week life span in a barn dedicated to meat hen production. Cornish Cross Meat Hens are far and away the most popular breed of Meat Hen and have been bred to reach maturity very quickly. They are eating and pooping machines...messy and smelly. 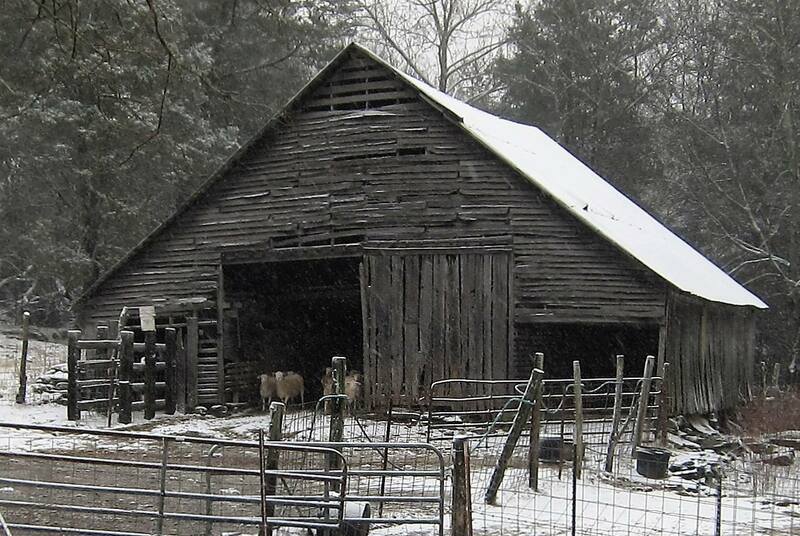 The Meat Hen Barn was a source of stress to The Farmer and me. It was upsetting to see our hens sitting Sloth-Like in the stinky barn doing nothing but eating. Seriously...they wouldn't move....food had to be literally placed in front of them because they wouldn't muster the energy to walk. Other farmers warned that it would be like that with Meat Hens but we wondered if we couldn't be Stewards of a different sort...to do better by the birds during their short time with us. The white Cornish Cross Meat Hens enjoy romping with the Laying Hens. Accordingly, when we got our next group we decided to let them free range alongside all of the other animals on the farm. We were delighted to see that, when given the opportunity to peck about in the yard and enjoy the fresh air and sunshine, they became an active part of Rosie Belle Farm. The skeletal structure of meat hens differs from laying hens and their little legs aren't designed to hold their pendulous bodies, so they have a funny little walk but they manage to hold their own. The physical exercise might result in less tender meat but we have not noticed a difference and it sure is easier on my heart! The lesson that I learned with that very first group of chickens all those years ago resounds just as strongly today. Animals count on their Farmer for competent Stewardship and we strive for excellence in that regard. We never stop learning or seeking to improve upon our practices. We raise Large Black Hogs, a docile endangered breed of Hog that forage on pasture rather than being confined to a pen eating grain. It is really something to see a 450 pound sow walking happily with the dogs and the chickens and the goats and the sheep! We do things a little bit differently than most...all of our animals have the opportunity to walk freely together throughout our entire sixty five acres and it makes for a peaceful, happy community. A Laying Hen Watches The Farmer strolling with a few of our Sheep, Goats, Chickens and Dogs. Fresh and Happy Tastes Better! Chickens are not born in shrink wrapped packages under the fluorescent bulbs of grocery store display cases. They are raised --some lovingly and some in Factory Prison Barns--and when the time comes they are butchered--"processed" is the Farm Vernacular and THEN they make their way to shrink wrapped packages. The end result is the same but the journey is significantly different. Know where your food comes from and consider supporting your local Farmer. ...and now, in what might be considered poor timing but certainly not poor taste...let's talk about Chicken Tikka Masala! I am a big fan of Indian Cuisine and Chicken Tikka Masala is year round comfort food for me. I always served it with Basmati rice until I had it with quinoa at Savory Jack's, an adorable neighborhood restaurant in Pulaski, Tennessee. The proprietor, Jack White, is a great chef but is probably best known for his work as a Hollywood Food Stylist ... if you saw Hunger Games, you saw his work. Anywhoo, he makes a great Quinoa Tikka Masala and it inspired me to recreate a version in the farm kitchen. Tikka Masala is not a difficult dish, but it does have several steps...including an overnight marinade....as well as ingredients that may not be a staple in your kitchen. You probably have most of what you need to get a dish that is evocative of Tikka Masala and that will be hearty and delicious. For example, if you do not have fresh Ginger Root or Garlic, substitute powdered. No red pepper? Skip it. A Recipe should serve as a guideline, not an unyielding Absolute. Simply read through the recipe and make substitutions as needed. Work with what you have on hand to make the best dish possible. 3 pounds of chicken, skinned, boned, and cubed. I used thigh meat because I had it in the freezer and dark meat is more forgiving--less likely to dry out in a stew. Add the chicken and marinate overnight. Once you have the marinade out of the way, the dish comes together fairly quickly. I used 2 cups of white quinoa, which makes 6 cups when cooked. Head over to The Kitchn for tips on making perfect Quinoa. Heat 2 Tablespoons of Olive Oil in a large saucepan at Medium Heat. Chop 2 onions into a 1/4 inch dice and toss them into the pan. Lightly caramelize the onions. This will take a while so thread the chicken pieces onto skewers and turn on the oven broiler, placing an oven rack on the highest shelf. I am not a fan of crunchy onions so I make sure to really caramelize them....but cook 'em the way you like them. Add the garlic and the ginger and cook two minutes. Add the Garam Masala, Coriander, and Cardamom and cook for another two minutes. The kitchen should be smelling pretty awesome right about now. Add the tomatoes, chopped red peppers, brown sugar, and water and simmer until the sauce cooks down a bit. Stir in the cream, red pepper, cilantro and/or mint and salt to taste. Broil the chicken skewers for 4 or 5 minutes, turning frequently. If you don't have skewers, just broil the chicken! Put a handful or two of fresh spinach on a plate...top with warm quinoa and masala sauce, which will wilt the spinach quickly. M'mmmm. Pull the chicken off of the skewers and place it on the stew. Garnish with mint, cilantro, and diced red pepper. Winter Weary but The Beet Goes On! It has been a somewhat mild winter in Middle Tennessee but even somewhat mild winters get long and dreary by Mid February. The color of our world is an immutable Mud Brown. Steady rains have turned the barnyard into a sloppy mess that sticks to our Muck Boots and follows us into the house. Twelve farm dogs race about as The Farmer and I do our chores....48 muddy paws sullying the already sullied floor. On the bright side...and there is always a bright side...the Wood Stove keeps us warm and dry and the often maligned Plywood Floors are completely indestructible...regardless of what the dogs drag in! The Calendar tells me that Spring is just around the corner which means that the seedlings will soon be planted and the Farm will once again come alive with GREEN. I cannot wait! The Cook Stove is a workhorse! It keeps the farmhouse cozy on the coldest of days! While our growing season has yet to begin, we are lucky to live within a few hours of a Wholesale Growers Market. The Farmer makes a weekly trek to Alabama so that our CSA members can enjoy fresh farm produce even when local fields are fallow. He brought home some beautiful, ruby red beets last week and I imagine that we will be seeing more of them in the coming weeks. We will pickle them, boil them, turn them into Hummus and toss them into salads, but my absolute favorite way to eat beets is to roast 'em. A caramelized beet is a real treat and Caramelized Beets with Onions and Goat Cheese are Sublime! Goat Cheese. We make ours on the farm but store bought will do in a pinch. Nuts for some crunch...I used Pine Nuts but use walnuts, almonds, pecans or whatever is in your cupboard! Unlike baking, which requires a high degree of precision, I am a bit more relaxed when playing with my veggies. I generally roast root vegetables at a fairly high temperature---somewhere between 425 and 450 degrees. The beets will roast more quickly at a higher temp and dicing them into smaller pieces will speed the process. Preheat your oven to 450 degrees and peel and dice the beets into 1/4 inch chunks. Throw them into a bowl and toss in some chopped garlic and rosemary. Season with a teaspoon or so of salt and add a generous splash of olive oil. Mix it all together...use a metal spoon if you don't want pink hands or a stained wooden spoon! Throw everything into a shallow baking pan (or start the process in the pan and save yourself a step) and pop it in the oven. Set the timer for twenty minutes and start slivering the onion. Sliver thin slices and put 'em into a pan with a splash of olive oil and a sprinkle of salt, which helps to sweat out the moisture within the onion. Properly caramelizing onions is a slow, leisurely process that should not be rushed. I have found the trick is to keep the heat on medium low, stir occasionally and find something else to keep you busy while the onions do their thing. You want the onions to slowly become translucent and then take on a beautiful golden color without leaving burnt residue in the pan...they will be much sweeter if you are patient! If I am making French Onion Soup I tend to really baby the onions along, taking up to an hour to properly caramelize them since they are the star of the show. No need to over-obsess in this instance since onions are only a supporting player in this dish. Check the beets when the timer goes off and give them a good stir. Set the alarm another ten minutes, stir the onions, and whip up the Dijon Vinaigrette if you are making your own. Pssst... a hand mixed dressing is always better and you probably have all the ingredients you need on hand! Take a minute to toast the nuts that you are using. Try not to skip this step as it enhances the flavor and the crunch! I simply tossed the pine nuts into a pan over medium heat and stirred gently to toast them. I almost burnt them but managed to avoid it by seconds. Nuts are like that...not ready, not ready, not ready, BURNT! Keep checking on the beets and stirring the onions. I found the beets to be perfect for my taste at 50 minutes. Slightly charred on the outside and soft and sweet on the inside. The onions should be about perfect as well. Combine the beets with the onions and slowly drizzle in the Dijon Vinaigrette. Put a hand full of fresh spinach or other greens on a plate, gently add a heaping helping of the beet mixture. Top with goat cheese and pine nuts. While we used this as a side for a Rosie Belle Farm ham steak, it would be great with chicken or shine as a Vegetarian meal!